The South Webster Jeeps defeated the Glenwood Tigers tuesday evening in a road victory, 8-1. Tigers at 6:00 pm in an SOC I soccer match. the Tigers entered the contest 0-2, seeking their first victory of the season. from the Tigers goalie to put the Jeeps ahead 1-0 early. Just three minutes later, Jeeps junior forward Gavin Bennett would possess the cross pass, sidestep a defender and sneak the shot by the keeper from short range to extend their lead to 2-0. South Webster would possess the ball for the majority of the half, keeping the ball in scoring position often. In the 16th minute, the Jeeps would strike again as this time, senior Sam Holstein would find the back of the net from inside the box, adding to his team’s lead and making the score 3-0. In the twentieth minute, the Jeeps lined up for their first corner kick of the game. Braden Martin would cross the corner kick into the box, leaving it to sail towards the awaiting goalkeeper. The Tiger goalkeeper was not able to secure the cross pass as yet another mishandle of the ball would result in the fourth Jeeps goal scored, this time by senior Zach Robinson. South Webster would lead at halftime 4-0. Entering the second half, the Jeeps wouldn’t miss a beat as just fifteen seconds in, Blevins would find Martin on a cross pass to the midfield for another goal. The placement of the pass would leave only the goalie to beat and although the keeper would get his glove on the ball, the deflection wasn’t enough to keep the Jeeps from taking a 5-0 lead. Moments later, Webster would make a mistake of their own as a bad pass would lead to an interception by the Tiger’s Junior Malachi Potts. Potts would then dribble past a defender and drive a shot off of his right foot from twenty yards that sailed over the outstretched hands of the keeper into the top right corner of the net. This goal would get New Boston on the board, but they would still trailing 5-1. 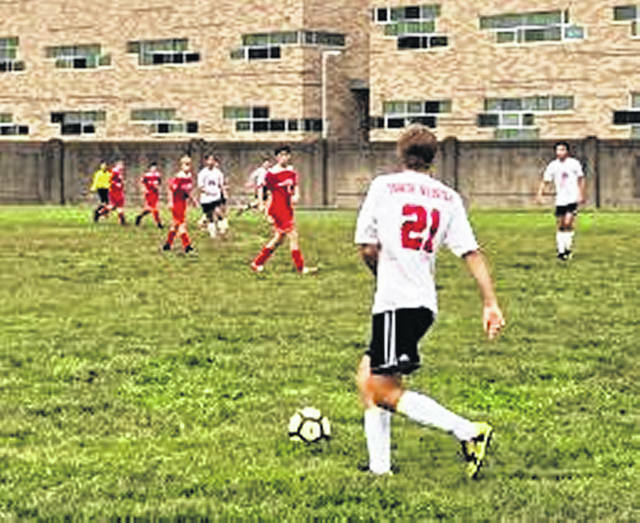 Blevins would quickly answer back for South Webster just minutes later as he would dribble though Tiger defenders into the open field, creating the opportunity to score his second goal of the match. The scoring seemed contagious for Webster as just one minute later, Bennett would make a steal and breakaway into open space with just the goalkeeper to beat. He would take advantage of the opportunity to tally his second goal of the match. The back to back goals from the Jeeps would extend the lead to 7-1. Freshman Trae Zimmerman would add one more goal for Webster late in the match to put the game away at 8-1.
with 4 minutes remaining, but the scoring chance would be saved by a diving Jeeps keeper as he guessed the right direction of the kick. Shortly after, the final whistle would sound and the South Webster Jeeps would take an 8-1 victory. You can catch the Glenwood Tigers back in action at home this Thursday at 5:00 p.m. as they face off against South Point. against Athens in a JV/varsity doubleheader. https://www.portsmouth-dailytimes.com/wp-content/uploads/sites/28/2018/09/web1_swsoc.jpgThe South Webster Jeeps defeated the Glenwood Tigers tuesday evening in a road victory, 8-1.